1. I am on board with thesis that CSCO can print consistent EPS beat and raises like IBM 2009-2013. Buybacks, dividends and lower OPEX can do wonders for the multiple and if I was the CFO that is exactly the multi-year plan I would be implementing. 2. Despite being one of the most popular posts I have written, I really do not know the details regarding what Insieme is building. What I can surmise is drawn from the materials Insieme people have recently revealed at industry conferences and what I see from them competitively in the marketplace. I have concluded that Cisco has not missed anything important in terms of SDN. I have also concluded that the A team at Cisco is focused on the real end game – not slideware. I take their competitive threat very seriously. I will also state that I am starting to see legit RFXs from customers for controller based solutions, which is my definition of SDN. The game is on and 2014+ will be very interesting as we refresh all networks. Every network is in play. 3. All the various bear case theses from the past couple of years have been or will be proven to be red herrings. In my opinion, the best bear case indicator for CSCO is look at the correlation of CSCO sales to industrial production numbers. I can get quite comfortable with a CSCO bear case based on spending, CAPEX, economic growth — but I am not comfortable with a bear case built around the CSCO team asleep at the innovation switch. It was not long ago that people were worried that OpenFlow would put Cisco out of business and today, it is a rare occurrence when any customer even asks me about OF. I think the same is true of the bare metal, commoditization, DIY theories. Cisco has a massive global supply chain and I think they are quite capable of using their buying power to match pricing. Cisco has a global army of CCIEs and VARs who are paid mercenaries. Networking is hard and Cisco is installed everywhere. I also think SP spending will be better. 4. 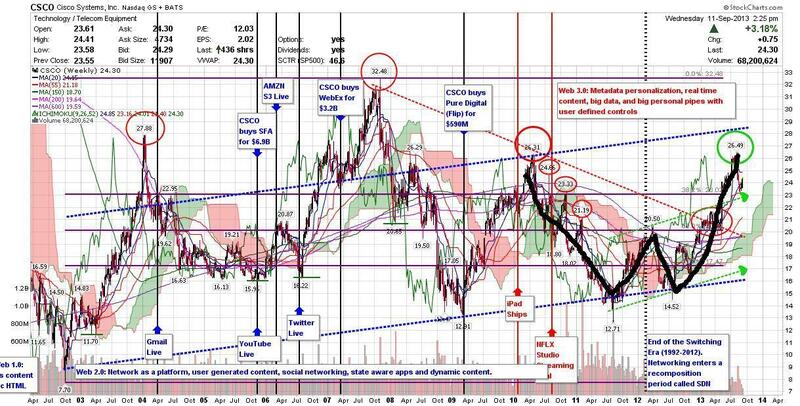 Look at these CSCO charts. Here is a link to my daily chart and here is a link to a 12Y weekly chart. I took the 12Y weekly and inserted it as a pic to the left with an edit. Check out the W; a very nice A-B-D-E-C formation. If you are into technicals then we are looking for a closing price level above $24.74. We are 38 cents away and I like the pattern confirmation at $20.50 price level. As always, I could be wrong, but I think these reasons setup a multi-year run for CSCO. At a minimum, it should be enough to put $32.48 into play. * Side note on FIO, which is up a lot after the CSCO purchase of Whiptail; I think I got whiplash from the 3,500 bps round trip on the stock. Moves like that are crazy.